Start off your visit on the 14th (Sat): take a stroll through Carcassonne Medieval City, step into the grandiose world of Chateau Comtal, take in the architecture and atmosphere at Eglise Saint-Nazaire, then contemplate the long history of Cathar Castles, then make a trip to Cité de Carcassonne, and finally steep yourself in history at Abbey of Saint-Hilaire. To find where to stay, maps, other places to visit, and tourist information, you can read our Carcassonne Center journey maker tool . Curitiba, Brazil to Carcassonne Center is an approximately 18-hour combination of flight and train. You can also do a combination of flight and shuttle. The time zone difference moving from Brasilia Time to Central European Time is 4 hours. Expect a daytime high around 28°C in September, and nighttime lows around 17°C. Finish up your sightseeing early on the 14th (Sat) so you can travel to Bonifacio. Kick off your visit on the 15th (Sun): make a trip to Bonifacio Citadel, make a trip to Escalier du Roi d'Aragon (King Aragon Steps), then explore the fascinating underground world of Grottes de Bonifacio, and finally kick back and relax at Plage du Petit Sperone. To find ratings, traveler tips, and tourist information, you can read our Bonifacio route planning site . You can do a combination of train, flight, and taxi from Carcassonne Center to Bonifacio in 5 hours. Alternatively, you can do a combination of car and ferry; or do a combination of train, ferry, and car. Expect a bit warmer weather when traveling from Carcassonne Center in September: highs in Bonifacio hover around 32°C, while lows dip to 17°C. 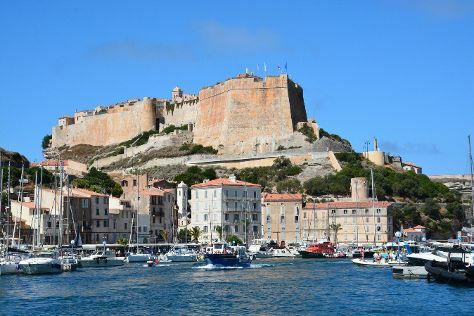 Finish up your sightseeing early on the 15th (Sun) so you can go by car to Calvi. Calvi is a commune in the Haute-Corse department of France on the island of Corsica.It is the seat of the Canton of Calvi, which contains Calvi and one other commune, Lumio. Kick off your visit on the 16th (Mon): discover the deep blue sea with a scuba or snorkeling tour, then kick back and relax at Aregno Beach, then look for all kinds of wild species at Punta Spano, and finally steep yourself in history at Citadelle de Calvi. To see more things to do, maps, traveler tips, and more tourist information, you can read our Calvi travel route planner. Getting from Bonifacio to Calvi by car takes about 4 hours. Other options: take a bus; or do a combination of bus and train. In September in Calvi, expect temperatures between 30°C during the day and 19°C at night. 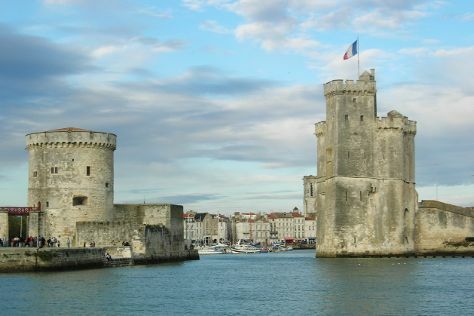 Finish up your sightseeing early on the 16th (Mon) so you can travel to La Rochelle. Start off your visit on the 17th (Tue): kick back and relax at Plage de Chatelaillon and then contemplate the waterfront views at Vieux Port. To find more things to do, traveler tips, photos, and more tourist information, go to the La Rochelle trip planner . Traveling by flight from Calvi to La Rochelle takes 5.5 hours. Alternatively, you can do a combination of flight and train; or do a combination of bus, taxi, flight, and train. Prepare for a bit cooler weather when traveling from Calvi in September: high temperatures in La Rochelle hover around 26°C and lows are around 15°C. Finish your sightseeing early on the 17th (Tue) to allow enough time to drive to Bayeux. Kick off your visit on the 18th (Wed): take in the history at Omaha Beach, then explore the different monuments and memorials at American Cemetery & Memorial, then contemplate the long history of Pointe du Hoc, and finally admire the landmark architecture of Notre Dame Cathedral. Get ready for a full day of sightseeing on the 19th (Thu): browse the exhibits of Museum of the Battle of Normandy, stroll the grounds of Bayeux War Cemetery, then explore the world behind art at Musee de la Tapisserie de Bayeux, and finally learn about all things military at Memorial of Caen. For traveler tips, maps, where to stay, and more tourist information, use the Bayeux trip builder tool . Drive from La Rochelle to Bayeux in 5 hours. Alternatively, you can take a train; or do a combination of bus and train. September in Bayeux sees daily highs of 24°C and lows of 13°C at night. Finish your sightseeing early on the 19th (Thu) to allow enough time to drive to Rouen. 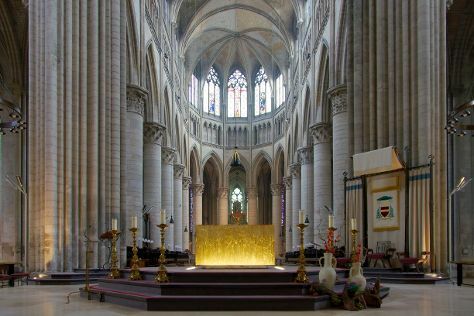 Kick off your visit on the 20th (Fri): admire the masterpieces at Musee des Beaux-Arts de Rouen, examine the collection at Musee de la Corderie Vallois, then get to know the fascinating history of Rue du Gros-Horloge, and finally admire the landmark architecture of Cathedrale Notre-Dame de Rouen. To find where to stay, other places to visit, traveler tips, and other tourist information, refer to the Rouen online day trip planner . You can drive from Bayeux to Rouen in 2 hours. Alternatively, you can take a train; or do a combination of train and bus. September in Rouen sees daily highs of 23°C and lows of 11°C at night. Wrap up your sightseeing on the 20th (Fri) early enough to take a bus to Paris. Kick off your visit on the 21st (Sat): admire the striking features of Sainte-Chapelle, then steep yourself in history at Cathédrale Notre-Dame de Paris, then explore the world behind art at Musee d'Orsay, and finally steep yourself in history at Eiffel Tower. On the 22nd (Sun), you'll have a packed day of sightseeing: make a trip to Basilique du Sacre-Coeur de Montmartre, then get a taste of the local shopping with Champs-Elysees, then appreciate the history behind Arc de Triomphe, and finally admire the masterpieces at Louvre Museum. To see maps, other places to visit, traveler tips, and tourist information, go to the Paris road trip planner. Traveling by bus from Rouen to Paris takes 1.5 hours. Alternatively, you can take a train; or drive. September in Paris sees daily highs of 24°C and lows of 13°C at night. On the 23rd (Mon), you'll have the morning to explore before heading back home.